The point of departure for Michael Stevenson’s work is often a singular historical event, object or story, and the constellation of relationships that develop around it. Through a research-based approach, building up complex layers of narrative and aggregations of auxiliary material, or reproducing the remains of particular events, these histories are converted and re-told in the context of contemporary art. Often based upon partial information, myths, rumours, or insider stories, he does not attempt to reconstruct an objective commentary but simply displays selected artefacts, and bits and pieces of information which all somehow work as material indices. Thus, in a manner akin to archaeology, he presents the traces of particular events, or stories, for scrutiny without attempting to interpret or categorize them, prompting our own forensic investigation and speculation upon their meaning. A particular focus of Stevenson’s attention has been ‘The Moniac’ (Monetary National Income Analogue Computer), an apparatus designed by New Zealand born economist, Bill Phillips, in 1949, that professed to calculate currency flows inside any given national economy. Taking the idea of currency flows literally, Phillips’ computer used water as an analogue for money, pumped through a complex system of interlocking pipes and tubes, which represented the different funds, fiscal channels and assets in a national economy. Valves at different points in the system would allow for the amount of water and direction of its flow to vary, thus simulating different scenarios, such as the shifting balance of trade, and enabling the ratio between expenditure and taxation to be measured according to the levels of water in the respective tanks after the machine had run its cycle. Thus Phillips attempted to convert the laws of Keynesian economic theory into the hydro-mechanical operating principles of a calculating machine. In reality, of course, the economic cycle was prone to constant leakage and general rusting. Of the twelve versions of the machine produced (or thirteen if one includes Stevenson’s own reproduction, The Fountain of Prosperity, made in 2007), one was purchased by the Central Bank of Guatemala in 1953, apparently in an attempt to stabilize the republic’s economy which had become monopolized by the US banana trade (hence the sobriquet, ‘banana republic’). The whereabouts of this machine since this time, however, remains unknown. 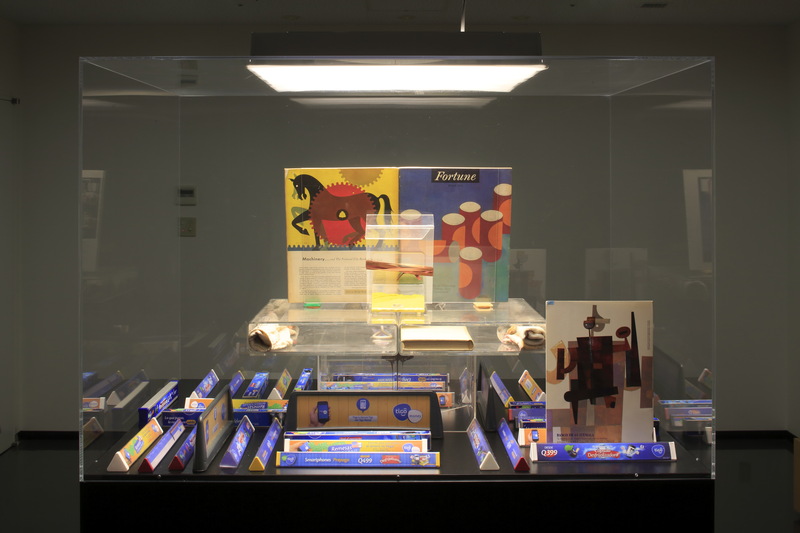 For the Dojima River Biennale, Stevenson presented an updated version of a related project, Fortune (2011-2015), displaying a collection of objects dedicated to the production of wealth and its measurement in Guatemala from 1952 to the present. The Moniac made its appearance here via the pages of Fortune – an American business magazine from the 1950s – in an article that reads more like advertising than reportage, ending with the machine’s purchase price in dollars. 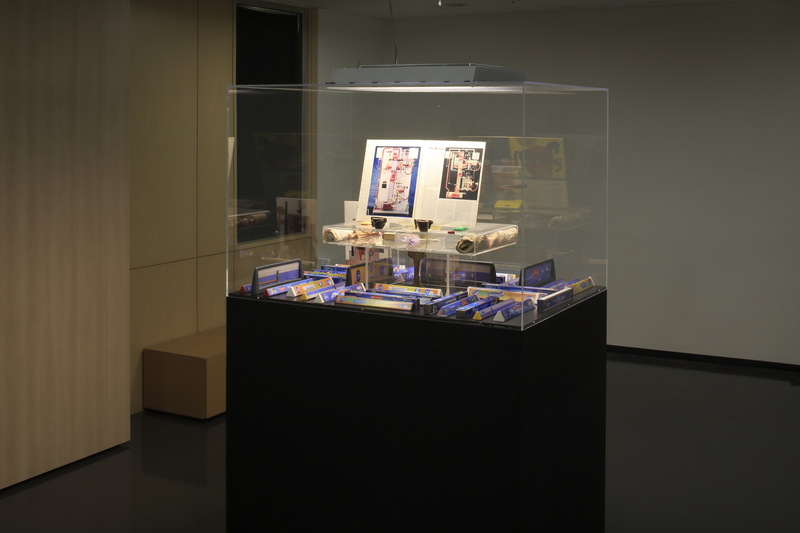 Surrounding the magazine, in a large Perspex vitrine (in a backroom storage area of the Forum), material from the artist’s research visit to the central bank in 2006 was displayed, along with subsequent additions to the layering of the story. This included material relating to Mario Lopez Estrada (grandson of the Guatemalan dictator who first granted concessions to the US-backed United Fruit Company) who recently became the country’s first billionaire as head of Tigo Guatemala, a mobile telecommunications network. In 2014 Tigo launched an intensive advertising campaign to encourage phone users to upgrade from their no-frills handsets, known as frijoles (‘little beans’), to smartphones, allowing further services such as money transfers independent of the regular banking system. The campaign depicted beans sporting baseball caps being transformed into smartphones as part of a process of ‘de-beanification’, here displayed in the form of supermarket checkout dividers (the only item in a store not for sale). Stevenson’s on-going interest in the concept of economy is as much to do with the circulation of ideas, myths and meanings as it is with the actual flow of money, revealing the flawed processes of conversion and exchange in a chosen system of belief, and the gap between an abstract model of equivalence and its operational reality. This entry was posted in Projects, Writings and tagged Dojima River Biennale 2015, fortune, fountain of prosperity, Michael Stevenson, moniac. Bookmark the permalink.